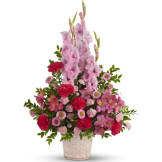 The Loving Grace arrangement is a warm and peaceful bounty of pastel blossoms that gently express love and respect. A gracefully composed arrangement that is appropriate for home or service. • Fresh flowers such as peach and light pink roses, lavender and purple larkspur, pink asiatic lilies, alstroemeria, gerberas and lisianthus are set in an exclusive Noble Heritage urn. 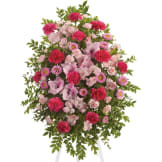 • Arrangement measures approximately 26" W X 30" H.
Flowers will be received by a Sunset Funeral Homes' staff. 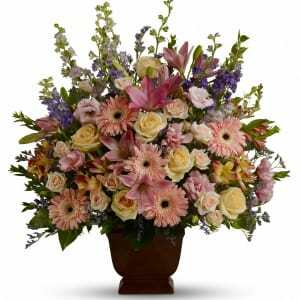 All of our flowers are designed and delivered by hand from a local florist in in El Paso.